To clear up this long-standing confusion, the authors of today’s paper used the Hubble Space Telescope to take spectra of both Sirius A and B in order to perform a differential measurement of the gravitational redshifts of both. Differential measurement is a useful tool as it helps eliminate a lot of systematic errors that might be present in an instrument, since any that exist will affect all observations equally. The gravitational redshift of Sirius A is better known than for Sirius B, so by measuring both, finding the difference between them, and correcting for the known value of Sirius A’s redshift it’s possible to make a more precise and accurate measurement of the gravitational redshift of Sirius B than would be possible by observing it alone. Gravitational redshift, even for a white dwarf like Sirius B, isn’t a very large effect. In earlier work the gravitational redshift for Sirius B was estimated to be 83 ± 3 km/s. At the wavelength of hydrogen alpha (Hα) which the authors used to measure the redshift, this corresponds to a shift in wavelength of just 1.81 ångströms (Å, 1×10−10 m) . Figure 1 shows the four spectra of Sirius B acquired by the HST, showing just how small such a shift is. 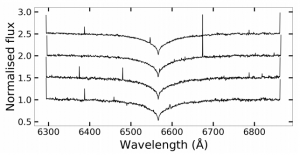 Figure 1: The four spectra of Sirius B taken by the Hubble Space Telescope for this paper, centered on the hydrogen alpha (Hα) line which the authors used to measure the redshift. The spectra have all been continuum-normalized and are shown offset by 0.5 vertically for clarity. Note the scale in Å on the horizontal axis. Figure 2 in the paper. 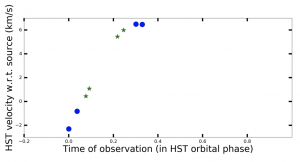 Figure 2: The velocity of the Hubble Space Telescope with respect to the Sirius binary system center of mass as a function of time over the time period when the observations used in today’s paper were taken. Blue circles are spectra of Sirius B, green stars of Sirius A. Figure 5 in the paper. Measuring the redshift of Sirius B required a lot of velocity bookkeeping for the authors: they had to account for the velocity of the HST around Earth (as shown in Figure 2), the velocity of Earth around the Solar System’s center of mass, and the velocities of Sirius A and B around their common center of mass. After correcting for all this they were able to get a measurement of the difference in redshift between Sirius A and B. By correcting for the (previously-calculated) value of the gravitational redshift of Sirius A of 0.759 km/s and comparing it with the differential redshift they found for Sirius B, the authors were able to get an absolute value of the gravitational redshift for Sirius B of 80.65 ± 0.77 km/s. This measured redshift was then used to compute the mass of Sirius B using a simple model. The value of 1.017 ± 0.025 solar masses from this calculation matches the value obtained by dynamical methods—1.018 ± 0.011 solar masses—almost exactly. And by combining the mass of Sirius B with its radius the authors were able to show that it fits nicely with our models of something called the mass-radius relation for white dwarfs, as shown in Figure 3. Figure 3: This shows where Sirius B sits on the mass-radius relation for white dwarfs. The different colors are for different temperatures; the green line is for the temperature that best fits Sirius B, 25,922 K. The solid and dashed lines have to do with whether the white dwarf has a thick or thin layer of hydrogen around its core. Figure 11 in the paper. Measuring white dwarfs’ masses using their redshifts is a useful tool for astronomers because it’s possible to do with just a few spectra, whereas the dynamical method can take years and only works for relatively nearby stars. By performing this differential test with our closest neighboring white dwarf the authors were also able to find and point out some small systematic effects with the Hubble Space Telescope’s spectrograph that will likely be of use to other people performing similar spectroscopy measurements on other white dwarfs that don’t have such convenient nearby reference stars. A hot test of GR Real-Time Stellar Evolution Supernovae from Blue Supergiants Seeing Red (and Blue): Two Sub-Populations of Type Ia Supernovae? Thanks! It’s such a clear and friendly article. BTW, do white dwarf itself emitting photon? I used to thought white dwarf could only have blackbody radiation, which do not have lots of signatures in spectrum, and also the light is too faint? Thanks! To answer your question, white dwarfs are extremely hot when they form (at the level of 150,000 K! ), and continue to cool off slowly by emitting electromagnetic radiation for a long time afterwards. This mostly takes the shape of blackbody radiation like you mentioned, since their atmospheres are mostly hydrogen and/or helium which don’t have many spectral lines in the visible region. That’s why the authors of the paper used the hydrogen alpha line, as it’s one of the few spectral lines normally visible in white dwarf spectra. And yes, white dwarfs are much fainter than main sequence stars—that’s how they were first noticed, by being much fainter than they “should” be—but they’re still bright enough for us detect quite a lot.